HomeAid Northern Virginia and Pulte Homes, along with a whopping 33 trade partners, celebrated the completion of one of the biggest projects in the 11-year history of HomeAid. 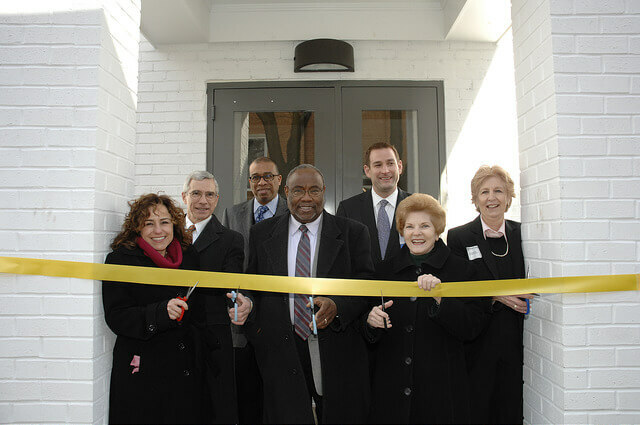 The Community Lodgings project centered on renovations to a ten unit apartment building in the City of Alexandria. Pulte and its trade partners were able to completely remodel the inside of the building to better accommodate the size of local homeless families, and provide safe, stable housing during their temporary stay. Pulte and trade partners also created a new entrance and portico, added a fresh coat of paint to the exterior of the building, improved the overall landscaping. When all was said done, the retail cost of the project was an enormous $900,000 and HomeAid was able to cover 44% of that cost. Thank you, Pulte Homes and the following Trade Partners, for your contributions to the project.